This was our fourth year hosting the Wild & Scenic Film Festival at The Blue Note in Columbia, MO, and it was a great success! On a cold, snowy Sunday afternoon, 250 people filled the venue to screen a diverse slate of films, feast on amazing treats baked up by River Relief volunteers and raise funds for Missouri River Relief. Thanks to many silent auction donations from a long list of community members and local businesses, we raised almost $6,000 for Missouri River Relief's local clean-up and education projects. Our theme this year was the connection between humans and the world we share. The event was hosted by Missouri River Relief, The Blue Note and several national sponsors listed on the right. 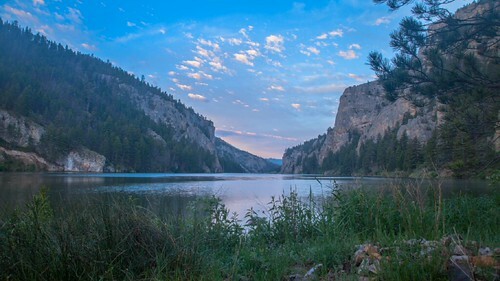 Thanks to a grant from Patagonia, Missouri River Relief was able to bring this inspiring and eye-opening film fest to our home town and we hope these films might inspire you to take action for the health and beauty of our community! (4 min.) 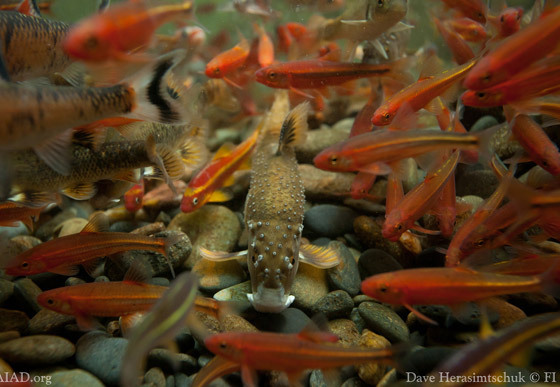 - Jeremy Monroe, David Herasimtschuk (U.S.A.-2013) Southern Appalachia is a little-known biodiversity hotspot for aquatic life and is home to some wildly diverse fish, mussels, salamanders, crayfish and other critters. Hidden Rivers takes an immersive look at the little-known creatures of these waters, their striking beauty and extreme vulnerability. It feels like a summer day swimming in the Ozarks. (16 min.) - Stephanie Haig, Darrell Lorentzen (U.S.A.-2013) The "new energy" economy is causing many nations to look again at massive hydroelectric dam projects. The Futaleufu River in Patagonian Chile is one wild place in the crosshairs of these new projects. In the 1980’s boaters successfully navigated the Futaleufu river in Chile, and eco-tourism flourished, bringing vibrant opportunities and jobs to the community. Local activists and boaters now fight to preserve this unique river and its community. (6 min.) - Richard Chisolm, Sheila Kincade (U.S.A.-2012) Chef Tony Geraci is at work remaking the Memphis School District's meal programs, incorporating local, non-processed, fresh foods into the meal plan. He is working with local farmers to design student-run gardens located right in the schools. “My job is to put healthy kids in front of educators so they can learn," says Geraci. (23 min.) - Ellen Tripler (U.S.A.-2013) Set in the foothills of the Appalachians, this film explores one man’s vision of using green burials to conserve land. The efforts of one small town doctor have radically changed our understanding of burials in the US. (4 min.) - Drew Christie (U.S.A.-2011) Animation. A hilarious intellectual showdown between a hipster and a sperm whale. (14 min.) - Sandy Patch (U.S.A./Ecuador-2012) For over 50 years Baltazar Ushca has harvested the glacial ice of Ecuador’s Mount Chimborazo. His brothers, both raised as ice merchants, have long since retired from the mountain. This is a story of cultural change and how three brothers have adapted to it. Best Short Doc, Woodstock FF, Woods Hole FF and Napa Valley FF. (3 min.) - Guillaume Blanchet (Canada-2012) An outrageous short by a man who lived on his bike for 385 days. 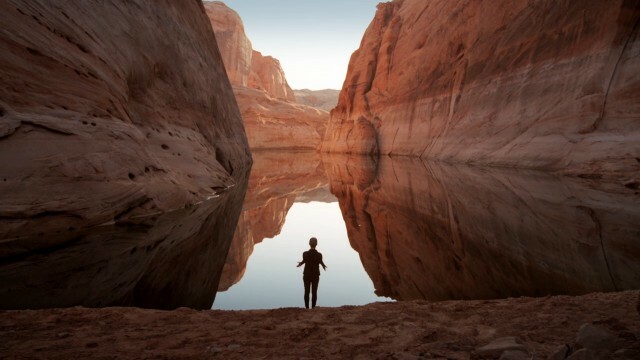 (6min) - Skip Armstrong (U.S.A.-2012) The life of a woman – her life, her dreams, her legacy – painted on the canvas of still waters in deep canyons. (15 min) - Alexandria Bombach (U.S.A. -2013) Gregg Treinish hiked the length of the Andes mountains with Deia Schlosburg, the director of "Backyard". This effort won the pair the National Geographic’s Adventurer of the Year Award. Gregg took the lessons he learned, his passion for the outdoors and his background in wildlife biology to found Adventurers and Scientists for Conservation, which pairs outdoor explorers with scientists to turn expeditions into data collection opportunities. (1 min) - Scott Mestrezat (U.S.A. - 2014) Last year Scott Mestrezat dropped his Chicago job and hit the river, in a way no one had done before. Using a stand-up paddleboard he built himself, he paddled the entire Missouri River from Three Forks to St. Louis, the first person to ever have done this. Perhaps the first person to have even thought of doing it. This year he will release a feature film created from his experiences. He's given us a little taste, and we cannot wait to see the rest. (6 min) - Roxana Pop (U.S.A. - 2013) Missouri River Relief and John Burroughs High School students spent a few chilly days camping on a Missouri River gravel bar and cleaning up trash from the river banks and islands. Romainian MU graduate student Roxi Pop put together this great video capturing the experience. And Thanks to The Blue Note! We've picked out a diverse slate of films we hope are challenging, inspiring and entertaining. Check out the film lineup here. River Relief folks can bake up a storm. It's a grab-and-go bake sale right in the Blue Note. And all the organic popcorn was donated by our local natural grocer, Clover's Natural Market ! We're honored that Dave Dearnley and Sam Shin will open and close the festival on stage. Dearnley is an award-winning singer/songwriter/guitarist and Shin is a versatile cello virtuoso. Thanks to these local individuals and businesses for their donations to our silent auction and raffle. Check out photos on Facebook. Carl and Anne Orazio - An Afternoon at Boathenge! Big Muddy Adventures - a guided Big River canoe trip in the handmade Junebug Canoe! Abigail's in Rocheport - Dinner for two! Lens & Pen Press - "Damming the Osage"